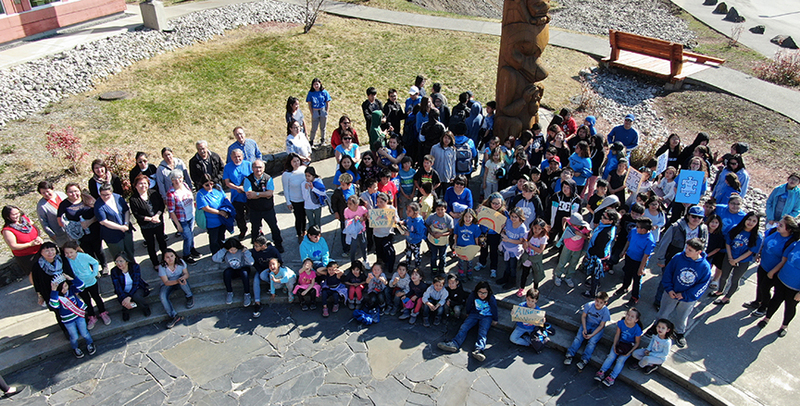 Students from NESS marched from the school to the Nisga'a Lisims Government building in Gitlaxt'aamiks on Tuesday, April 2 for World Autism Awareness Day. The theme was gwisgwoosgum goypax, Light it Up Blue. Wearing blue shirts to mark the occassion, students and teachers gathered outside the NLG building. Executive Chairperson Brian Tait and Willard Martin, Sim'oogit Ni'isyuus, Chairperson of the Council Of Elders addressed the students, speaking about kindness and doing our best to support everyone in the community. Grade 1/2 teacher Lena Griffin and Grade 8 student Kristin Young also spoke. A recording of the event can be found on the NLG Facebook page. World Autism Awareness Day exists to raise awareness about and encourage support for those with Autism Spectrum Disorder.